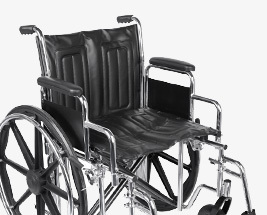 Here at Incontinence Choice, we offer a range of bariatric wheelchaira especially designed to offer extra support for overweight wheelchair users. This range includes wheelchairs with a variety of seat widths and suitable for weight capacities from 22 stone and above. To support larger weights, these wheelchairs are manufactured from steel, making them a heavier and stronger wheelchair than other models. Please browse our range, including brands such as Drive Medical and Z-Tec.